We spend a lot of time thinking about tools, technologies and frameworks. We spend a lot of time thinking about tools, technologies and frameworks. How much time do you spend thinking about the impact of what you’re building? Dark Patterns are tricks [used in websites and apps] that make users do things that you didn't mean to. We’re spending a lot of time thinking about how to collect more and more data. We’re spending a lot of time thinking about how to collect more and more data. How much time do you spend thinking about how to secure that data? The data you don’t have stored, can’t be leaked, lost or stolen. Respect your users’ time. Happy users will be much more likely to forgive. Everybody wants to create better experiences. How would you like to be treated? What are you willing to do for it? We need to get our values and ethics right. Today. By thinking about the user, how to treat and what to serve them, it’s possible to achieve better performance, offer improved privacy and security and become better at our craft. Design with the intent to do ~~good~~ better. 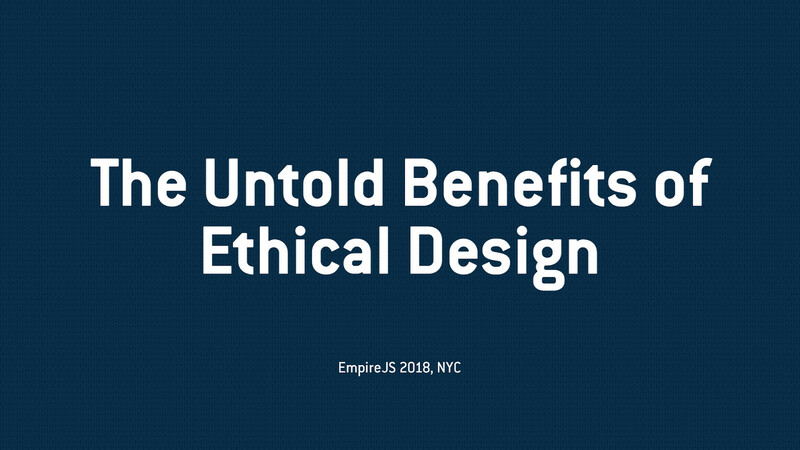 Ethics need to be at the core of everything we build. We have to consider our impact and rethink how to build digital products. This way we will not only build more responsible products, but gain additional benefits in the areas of performance, security and privacy. This talk will show how we can truly care about our users & improve their experience. Most importantly, this talk will be an inspiration, question the status quo and help us build for a better web. Wow. Great talk @foobartel. Just a really great way to start the conference. I'm in awe.